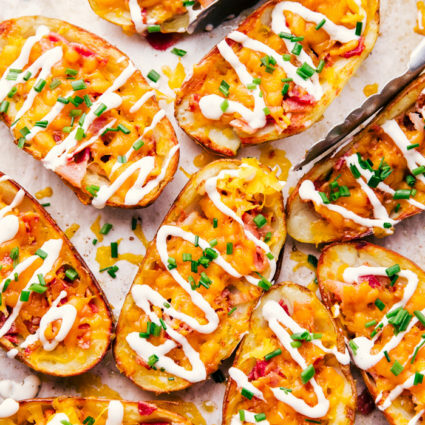 Cheese and Bacon Potato Skins are the perfect recipe for your next tailgating conquest. Loaded with crispy bacon, gooey cheddar cheese and topped with ranch dressing and chives, this recipe will put a “W” in the win column. Appetizers are my go to for any party I am having. 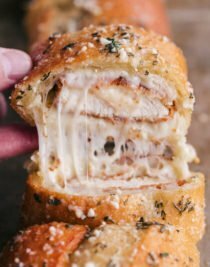 If you love to make easy appetizer you should also try stuffed jalapeno poppers, also topped with bacon they will bring the heat, or these cheesy pigs in a blanket that the kids will love. If you want to set it and forget it these sweet and spicy crock pot party wings will do the trick. Every week I look forward to the next Saturday filled with all things football. I know, pretty lame right? WRONG! 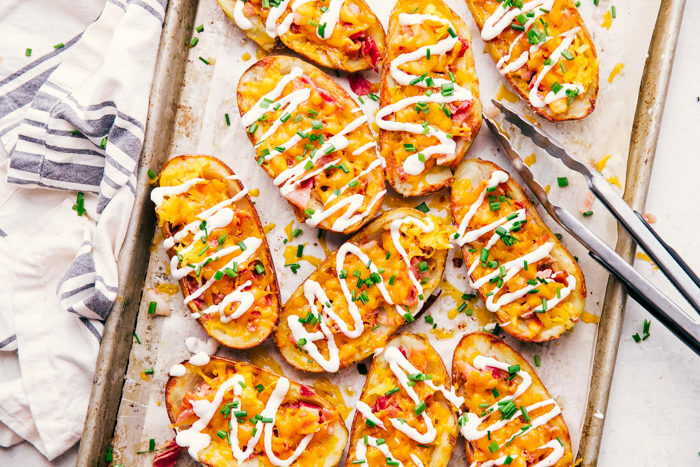 It means I get to bust out some delicious appetizers and eat all day long and these cheese and bacon potato skins are a game changer. 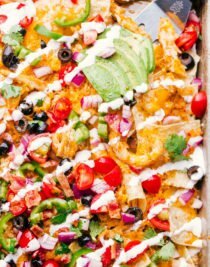 Loaded with only a few ingredients to make them the ultimate finger food for a fun day ahead. So join me on Saturday and try your hand at these amazing and easy potato skins with cheese and bacon. So last week the University of Washington played Utah and won, hooray! This week they are playing Arizona State University for their Pac 12 home opener and I will be at the game! I can’t wait. But, for those of you who will be watching in the comforts of your own home having friends and family over you have got to make them these bacon cheddar potato skins. 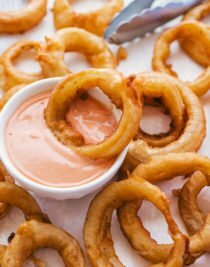 Everyone will love them and topping them off with a little ranch dressing and hot sauce makes them a party on a plate. 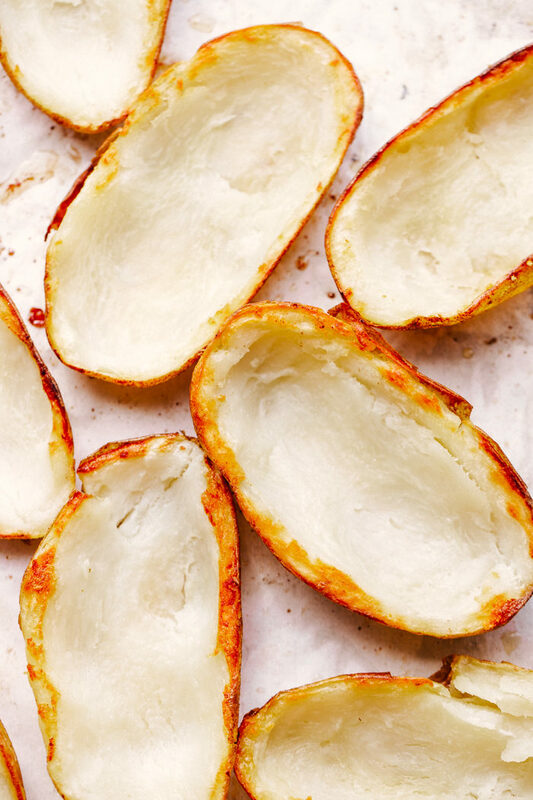 Potato skins are an amazing appetizer or finger food using unpeeled potatoes. They are baked in the oven, skin on, and then sliced in half to remove the inner “meat” of the potato. You can reserve the hollowed out meat portion of the potato for other uses, such as making mashed potatoes. The hollowed portion of the potato now serves as a cup to hold as many ingredients you like to fill them back up. How do you make cheese and bacon potatoes? Preheat oven to 400 degrees. Pierce several holes in the potatoes with a fork and place on a rimmed baking sheet. Bake for 50 minutes and cool until you can touch safely. 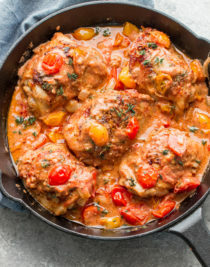 Increase oven temperature to 475 degrees. Cut potatoes lengthwise in half and scoop out inner flesh. Brush hollowed potatoes with melted butter and cook 14 more minutes. Flipping potatoes over halfway through. Fill each potato skin with bacon and top with cheddar cheese. return to oven and cook 2 minutes until cheese has melted. Layer the top with ranch dressing, hot sauce and diced chives. How do you make potato skins crispy? Preheat oven to 400 degrees and poke several holes in potatoes with a fork. 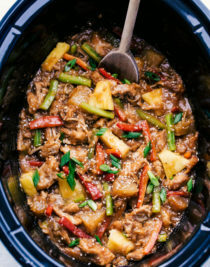 Bake for 50 minutes. Allow to cool so you can handle. Slice potatoes in half lengthwise and scoop out inner flesh, reserving just enough around the border so the potatoes don’t break. Melt butter and brush all over the potatoes, inside and out. Increase oven temp to 475. 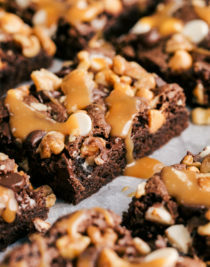 Place on a rimmed baking sheet and return to the oven. Bake 14 minutes, flipping the potato skins halfway through until golden brown and crispy. What can you have with potato skins? You can fill potato skins with so many different things: here are a few ideas. One of the great things about appetizers and making potato skins with bacon is that just by adding cheese you can have a simple finger food that everyone can devour. So bring on game day with some fierce appetizers and make these cheese and bacon potato skins it will be a crowd pleasing recipe no matter who wins the game. 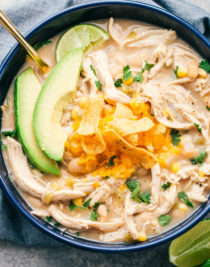 Are you looking for more appetizer recipes? 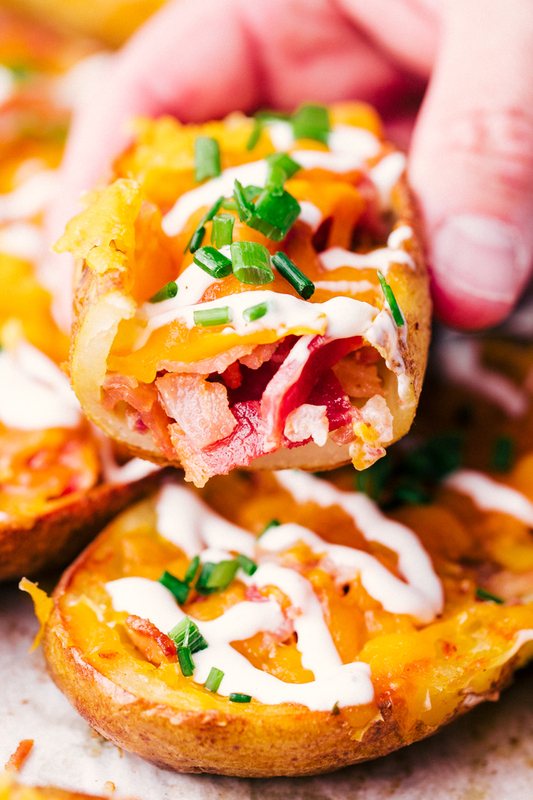 Cheese and Bacon Potato Skins are the perfect recipe for your next tailgating conquest. Loaded with crispy bacon, gooey cheddar cheese and topped with ranch dressing and chives, this recipe will put a "W" in the win column. 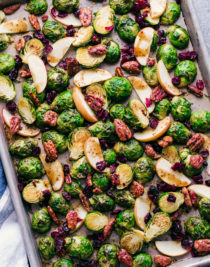 Increase oven temperature to 475 degrees. Cut potatoes lengthwise in half and scoop out inner flesh. Brush potatoes inside and out with melted butter and cook 14 more minutes. Flipping potatoes over halfway through.